The light from billions of galaxies shines at minuscule frequencies compared to modern atoms. The most-distant galaxy analyzed with spectroscopy (to date) clocked about 8% of the frequencies of modern atoms. Photos of dimmer galaxies (that subtend smaller angles) gleam at far infrared and microwave frequencies from the ancient universe. 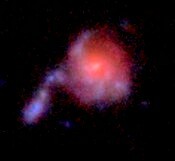 We observe (at many ranges) how streams of bluer stars emerge from the often red cores as galaxies grew, often into local, growth spirals. NASA’s Deep Space Network sent a stream of radio signals out to four distant spin stabilized spacecraft. (Spin stabilized craft maintain their orientation by spinning the entire craft. Most of today’s spacecraft use internal heavy wheels to orient the craft, which can produce unknown accelerations.) The radio signals were derived on Earth from hydrogen maser atomic clocks. The distant space craft locked onto the radio signals, multiplied them by a ratio and returned the same signals back to Earth. When NASA analyzed the returned signals, they found an unexpected acceleration. Astronomers use the Hubble ratio to estimate the distance to ancient galaxies using their observed light clock signals (their colors). Strangely, the offset in clock frequency that NASA detected was similar to the Hubble ratio times light speed. Local atomic clocks seemed to be speeding up (compared to their speed in the past – that is to distance and light-speed) in the same way as the atomic clocks in hundreds of billions of ancient galaxies. We also observe that atomic clocks near the Earth’s surface run slower than similar clocks farther from the surface. What is it about the proximity to matter that causes atomic clocks to run slower? Are these effects due to space-time? The notion that clocks measure time is merely a definition. Neither time nor space-time can be observed. Solomon stated in Ecclesiastes 3:11 that God made everything beautiful in its event season. However, He place olam (undetectable, over the horizon events) in our hearts so that we cannot understand all that God has done from beginning to end. Time has no actuality. It exists in our minds. Time ideas prevent us from understanding earth history. Scientists often claim that space is expanding itself, stretching the light from distant galaxies. No one has ever observed light changing frequency as it passes through a void. There is not a shred of visible evidence for an expanding vacuum. Expanding space time is an ad hoc theory to preserve the notion that atoms continue to dither at the same frequencies. The most powerful evidence against the Big Bang is visible cosmic history. Scientists insist that stars gravitationally condensed from clouds of diffuse space dust. We observe the opposite. Galaxies intrinsically grew as the stars continued to form and continued to spread out from tiny point sources. The space matter takes up, its light-clock frequencies and its inertial properties all changed together as the stars continued to emerge and spread out. Even within the same galaxy or galaxy cluster, we observe that objects clock different spectral frequencies. What we observe suggests that matter continues to change relationally, its properties changing in parallel. Jeremiah 31:37 Thus says the LORD, “If the heavens above can be measured And the foundations of the earth searched out below, Then I will also cast off all the offspring of Israel For all that they have done,” declares the LORD. Why can’t we measure the distance to the stars? There are no constants. Every atom and every orbit is observed to change. Why can’t scientists accept the only history that is visible as it happened, galactic history? Peter predicted that in the last days mockers will claim: all things that exist remain the same. They will ignore the evidence that the plural heavens came out (ek pali) long ago and Earth’s watery past because of an idea – that all things remain the same. This prophesy has come true. Western science was founded on the medieval idea that the essence of substance is changeless. With this one assumption, generations of scientists invented empirical definitions for matter and time and mathematical laws of physics. They measure synthetic things like mass energy and time that they circularly contrived with their fundamentalist assumption. However, none of the laws of physics works in the distant universe. Scientists have been forced to fill the universe up with magical things like invisible matter, expanding vacuums and a big bang. This is not a minor fudge factor. Allegedly 84% of the matter in the universe is invisible, in order to force galactic orbits to follow the laws of physics. Supposedly, 70% of all processes in the universe involve the accelerating expansion of the anti-gravity vacuum of space time. None of these ad hoc stories are necessary if scientists could just examine their fundamental assumption – the one Peter predicted – that all things remain the same. Everywhere we see the evidence for a literal biblical creation. Lift up your eyes and look at galactic history. The photo is from the Hubble Ultra Deep filed and shows primordial galaxy 4491 as it jets out a stream of blue star globs from its red core.This galaxy shines at less than half the frequencies emitted by modern matter. 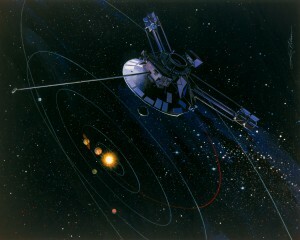 The drawing of the Pioneer spin stabilized spacecraft is from NASA, which is why it is in the public domain.